Department of Quality Assurance, D. S. T. S. Mandal’s College of Pharmacy, Solapur - 413004, Maharashtra, India. ABSTRACT: A Reverse Phase-High Performance Liquid Chromatography method has been developed and validated for estimation of sodium benzoate and potassium sorbate in food products. The RP-HPLC method for sodium benzoate and potassium sorbate was developed using Luna C18 column (150 mm × 4.6 mm, 5 µm) as stationary phase and acetonitrile: sodium acetate buffer pH 4.3 (20:80) as mobile phase at 1.0 ml/min flow rate and detection was carried out at 235 nm and the methods were validated in accordance with ICH guidelines. Sodium benzoate and potassium sorbate have linearity in the concentration range of 1-30 µg/ml in with correlation coefficient (r2= 0.999 & r2=0.999) respectively. Sodium benzoate and potassium sorbate eluted at 4.9 and 6.9 min respectively. The values of LOD were 0.59 and 0.39 and LOQ were 1.8 and 1.1 for sodium benzoate and potassium sorbate respectively. Results of assay and validation study are satisfactory. So, the methods can be successfully applied for the routine analysis of sodium benzoate and potassium sorbate. INTRODUCTION: In recent years, concern about the importance of food and diet quality has been growing, especially due to increase in the incidences of diseases that are directly or indirectly related to nutrition habits. As a natural outcome, analysis of food additives came into focus for the assessment of their harmful potentials and quantitative and qualitative value of risks related to their use. A food additive is defined as a substance or a mixture of substances, which are generally added to processed foods for a specific purpose such as prevention of spoilage, conservation or fortification of color, flavor, texture or control of pH, moisture, crispness etc. Food additives may be divided into preservatives, artificial sweeteners, colorants, stabilizers etc.1 Food and Agricultural Organization (FAO) and World Health Organization (WHO) have combined to form a Joint FAO-WHO expert Committee on Food Additives (JECFA) to evaluate and establish the acceptable daily intake (ADI) which is expressed in milligrams per kilograms of body weight per day. The most commonly used preservatives in foods are sodium benzoate and potassium sorbate, the use of which is limited by the regulating bodies. Sodium benzoate is a widely used food preservative, with an E number of E211. It is the sodium salt of benzoic acid. It is bacteriostatic and fungi static under acidic conditions. Commonly reported side effects of sodium benzoate include: eye irritations, urticaria, abdominal pain, asthma, hypertension, attention-deficit / hyper- activity disorder and vomiting. The ADI set by JECFA is 5 mg/kg bw 2. Potassium sorbate [potassium; (2E, 4E)-hexa-2,4-dienoate] is the potassium salt of sorbic acid. It is primarily used as a food preservative and it is codified as E202. Potassium sorbate is used to inhibit growth of molds and yeasts in many foods, such as cheese, yogurt, soft drinks and fruit drinks, and baked goods. Allergic symptoms such as itching of the mouth, throat, eyes, skin as well as nasal congestion, runny nose and abdominal pain usually begin within 2 h after coming in contact with the allergen. The ADI set by JECFA is 25 mg/kg bw 3. Thus, the analytical determination of these preservatives is not only important for quality assurance purposes but also for consumer interest and protection. The present work deals with the development and characterization of a rapid and simple HPLC method for the simultaneous estimation of sodium benzoate and potassium sorbate in food products without an extensive sample pre-treatment. The proposed method has excellent performance characteristics, with a real potential to become a powerful tool for food safety. Materials: Sodium benzoate and potassium sorbate were obtained as a gift sample from Bimal Pharma Pvt. Ltd., Mumbai and GlaxoSmithKline Plc, Hyderabad respectively. Various food products were obtained from local market. HPLC grade acetonitrile LiChrosolv®, methanol LiChrosolv®, water LiChrosolv®, sodium acetate LiChrosolv® and glacial acetic acid LiChrosolv® were purchased from Merk Specialities Pvt. Ltd., Mumbai. Instrumentation: The analysis was performed using Younglin Acme 9000 series quaternary gradient pump SP930D. HPLC system with UV 730D UV-Visible detector and 20 µl Rheodyne injector. The data was processed on Autochrom-3000 software. Column C18 (150mm × 4.5mm, 5µ) Phenomenex with UV method analysis was performed on UV-Visible Double Beam spectro-photometer Shimadzu 1800. All chemicals were weighed using Electronic balance AY220 (Shimadzu, Japan). Mobile phase filtered through a nylon 6, 6 membrane 0.45 µm 47 mm filters (Pall India Pvt. Ltd., Mumbai) using vacuum pump. Ultra Sonicator (Microlean-103) was used for degassing the mobile phase. The solutions were filtered through 0.45µ syringe filter (Phenomenex). Chromatographic Conditions: The chromato-graphic separation was performed using analytical column: Phenomenex C18 column (150 × 4.6 mm, 5 µm) using mobile phase acetonitrile: sodium acetate buffer pH 4.3 (20:80) at a flow rate of 1.0 ml/min with iscocratic elution. The injection volume was 20 μl and the run time was 10 min. Detection was carried out at 235 nm 4, 5.
a) Standard Stock Solution of SB: 10 mg of standard SB was weighed and transfered to a 10 ml volumetric flask then dissolved in HPLC Water LiChrosolv® and the volume was made up to the mark with water to obtain conc. of 1000 µg/ml of SB and labeled as ‘Std Stock SB’. b) Standard Stock Solution of PS: 10 mg of standard PS was weighed and transferred to a 10 ml volumetric flask then dissolved in HPLC Water LiChrosolv® and the volume was made up to the mark with water to obtain conc. of 1000 µg/ml of PS and labeled as ‘Std Stock PS’. c) Combined Standard Stock Solution of SB and PS: 1 ml of ‘Std Stock SB’ and 1 ml of ‘Std Stock PS’ was transferred to 10 ml volumetric flask and diluted to 10 ml with HPLC Water to get ‘Std Stock MIX SB PS’ (100 µg/ml SB and 100 µg/ml PS) 6. Sample A (Lauki-Amla Juice): 1 ml of sample A was pipetted out and transferred to a 10 ml volumetric flask. The volume was made up to the mark by HPLC water. Further dilution was done by pipetting out 1 ml from the same volumetric flask and transfer to another 10 ml volumetric flask. The volume was made upto the mark by HPLC water. Sample B (Jam): 10 gm of sample B was transferred to a 20 ml beaker. The volume was made upto the mark by HPLC water. Further dilution was done by pipetting out 2 ml from the same beaker and was transferred to a 10 ml volumetric flask. The volume was made up to the mark by HPLC water. Sample C (Cake): 10 gm of sample C was transferred to a 50 ml beaker. The volume was made up to the mark by HPLC water. Further dilution was done by pipetting out 1ml from the same beaker and was transferred to a 10 ml volumetric flask. The volume was made up to the mark by HPLC water. Sample D (Fizz Juice): 2 ml of sample D was transferred to a 10 ml volumetric flask. The volume was made up to the mark by HPLC water. All the samples were degassed in an ultrasonicator for 30 min and filtered through a nylon filter membrane (0.45µm) prior to use 4, 5. Preparation of Mobile Phase: Mobile phase was prepared by mixing 20 ml of acetonitrile and 80 ml of sodium acetate buffer (pH 4.3) and filtered through 0.45 µm nylon filter using vacuum pump and ultrasonicated for 30 min for degassing. Method Validation: The developed analytical method as per the ICH Q2 (R1) guideline it is suitable for the intended purpose with respect to various parameters such as specificity, linearity, range, accuracy, precision, limit of detection, limit of quantification, robustness, system suitability 6. Specificity: The chromatogram of standard solution of mixture of SB and PS was compared with food products 7. Linearity: 0.1, 0.2, 0.5, 1, 2 and 3 ml of ‘Std Stock MIX SBPS’ were transferred in a series of 10ml volumetric flasks. The volume was made up to the mark with HPLC water to obtain the conc. of 1, 2, 5, 10, 20 and 30 µg/ml of SB and 1, 2, 5, 10, 20 and 30 µg/ml of PS. The solutions were filtered through 0.45µ syringe filter and 20 µl injected into the HPLC system and their chromatogram were recorded for 10 min under the chromatographic conditions as described above after getting a stable baseline. Peak areas were recorded for all the peaks. Calibration curves of SB and PS were constructed by plotting the peak area of SB vs. conc. of SB and peak area of PS vs. conc. of PS, respectively. The correlation coefficient (r2) of least square linear regression for SB and PS was calculated 8. Range The range of analytical method was decided from the interval between upper and lower level of calibration curves 9. Precision 10 µg/ml of SB and 10µg/ml of PS solution was filtered through 0.45 µ syringe filter and 20 µl injected into the HPLC system and its chromatogram was recorded under the same chromatographic conditions after getting a stable baseline. Peak area was recorded. The procedure was repeated for six times 10. Accuracy 1, 0.5, 0.5, and 2 ml from sample A, B, C, and D respectively was taken and transferred to 10ml volumetric flasks each. The volume was made up to the mark with mobile phase. Similarly, another 4 sets were prepared with the addition of 1ml of ‘Std Stock MIX SBPS’ in each. All the solutions were filtered through syringe filter and injected into the HPLC system and their chromatograms were recorded under the same chromatographic conditions after getting a stable baseline. Peak areas were recorded and percent recoveries were calculated 11, 12. Limit of Detection: LOD calculated by the following formulae 13. Limit of Quantification: LOQ calculated by the following formulae 14. Where, SD- Standard deviation; S- Slope of Curve. Robustness Combined standard solution of SB (10µg/ml) and PS (10µg/ml) was prepared and analyzed at different flow rates (0.9, 1.0, 1.1 ml/min) and different wavelengths (234, 235, 236 nm) separately 15. System Suitability Chromatograms were studied for different parameters such as tailing factor, resolution and theoretical plates to see that whether they comply with the recommended limit or not 16. RESULTS AND DISCUSSION: In order to develop RP-HPLC method for combination of sodium benzoate and potassium sorbate, the chromatographic conditions were optimized in order to find the best conditions. Different mobile phase like acetonitrile, methanol, water and buffer in varying proportions of mobile phases were tried for better resolution 17, 18, 19. After several combinations of mobile solvents with stationary phase C18, the above method has been optimized i.e. acetonitrile: sodium acetate buffer (pH 4.3) in the ratio of 20:80 respectively using C18 column which has given good resolution, capacity factor, and acceptable system suitability. Chromatographic peak of both drugs are identified by overlaying individual drug with chromatograph of mixture. Both drugs eluted within 10 min which reduces the analysis time and cost 20. CONCLUSION: This research was aimed to extract and evaluate the amount of preservatives in various food products. The proposed method was RP-HPLC which was found to be appropriate due to its simplicity, reliability, sensitivity, rapidness, and selectivity for detection at very low concentrations. It could recognize the preservatives at one wavelength in less than 10 min and involves minimal sample preparation. The recoveries were within 97-102% which implies that the method is accurate. It was found that sample C (cake) exceeded the permissible limit of preservative and was not in accordance with the limits set by Food Safety and Standards Authority of India and CODEX STAN 192-1995. However, the other 3 samples complied with the limits satisfactorily. In conclusion, the HPLC method is simple, accurate, reliable and reproducible method for simultaneous estimation of SB and PS in food products. Optimum values of the retention time, pH, flow rate and mobile phase ratio for good separation of the analytes were determined. The optimized HPLC methods were validated and based on the results obtained the proposed method is found to be linear, precise and accurate. Validation data demonstrates that this method can be used in routine analysis of sodium benzoate and potassium sorbate in various food products. ACKNOWLEDGEMENT: The authors thank to the management D. S. T. S. Mandal’s College of Pharmacy, Solapur for providing the necessary facilities to carry out the research work. The authors also thank Bimal Pharma Pvt. Ltd., Mumbai and GlaxoSmithKline Hyderabad for providing the gift sample of sodium benzoate and potassium sorbate. Qinghua Y, Li Y, Xiaoqin M and Huigen F: Simultaneous determination of six food additives in drinks by High Performance Liquid Chromatography Coupled to Diode Array Detector Detection. J Chem Soc Pak 2013; 35(4). 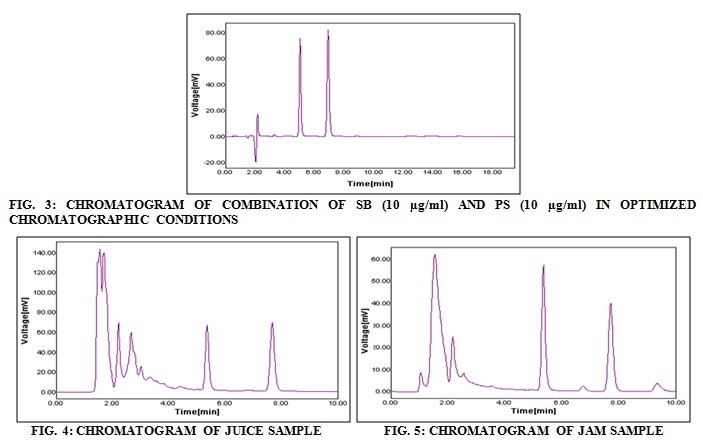 Altiokka G, Ergun B, Can N and Aboul‐Enein H: Validated Reversed Phase HPLC method for the analysis of the food additive, sodium benzoate, in soft drinks and jams. J Liq Chromato Relat Tech 2007; 30(8): 1125-1136. 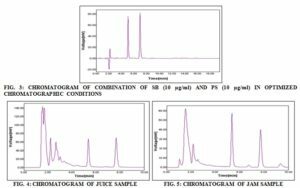 Sohrabvandi S, Vesal H, Mortazavian A and Mohammadi A: Simultaneous determination of potassium sorbate and sodium benzoate in doogh using High Performance Liquid Chromatography. Orient J Chem 2015; 31(3): 1793-1799. Khosrokhavar R, Sadeghzadeh N, Hajiaghaee R, Amini M and Ghazi-Khansari M: Simultaneous determination of preservatives (sodium benzoate and potassium sorbate) in soft drinks and herbal extracts using HPLC. J Med Plants 2010; 9(35): 80-87. Bahremand N and Eskandari S: Determination of potassium sorbate and sodium benzoate in "Doogh" by HPLC and comparison with spectrophotometry. Intl J Bio-Inorg Hybrid Nanomater 2013; 2(3): 429-435. Ahmed M, Waseem R, Kiran S, Ahmad W and Shahzad S: Sodium benzoate and potassium sorbate in pakistani retail foodstuffs. Intl J Chem Res 2013; 3(6): 1-6. Zamani Mazdeh F, Esmaeili Aftabdari F, Moradi-Khatoonabadi Z, Shaneshin M, Torabi P and Shams Ardekani M: Sodium benzoate and potassium sorbate preservatives in Iranian doogh. Food Addit Contam: Part B 2014; 7(2):115-119. Sneha S and R Preetha: Determination of sodium benzoate and potassium sorbate contamination in ready to serve products in post market surveillance in Chennai 2015. Discovery 2015; 51(240): 176-183. Faraji M and Rahbarzare F: Simultaneous determination of four preservatives in foodstuffs by HPLC. Nutr Food Sci Res 2016; 3(2): 43-50. Jankulovska M, Markovska L, Ilievska B and Trpkovska S: HPLC method for determination of preservatives in beverages. J Agric Food Environ Sci 2016; 67. Pylypiw H and Grether M: Rapid HPLC method for the analysis of sodium benzoate and potassium sorbate in foods. J Chromatogr A 2000; 883(1-2): 299-304. Dinç Zor Ş, Aşçı B, Aksu Dönmez Ö and Yıldırım Küçükkaraca D: Simultaneous determination of potassium sorbate, sodium benzoate, quinoline yellow and sunset yellow in lemonades and lemon sauces by HPLC Using Experimental Design. J Chroma Sci 2016; 54(6): 952-957. Salehi S, Khodadadi I, Akbari-adergani B, Shekarchi M and Karami Z: Surveillance of sodium benzoate and potassium sorbate preservatives in dairy products produced in Hamedan province, North West of Iran. Intl Food Res J 2017; 24(3): 1056-1060. How do I Develop an HPLC Method. Tech Article; 2001. Shaikh SK, Kalshetti MS and Patil RY: HPLC method development for simultaneous estimation of sodium benzoate and potassium sorbate in food products. Int J Life Sci & Rev 2018; 4(5): 88-93. doi: 10.13040/IJPSR.0975-8232.IJLSR.4(5).88-93. Authors Address: Department of Quality Assurance, D. S. T. S. Mandal’s College of Pharmacy, Solapur, Maharashtra, India.